I saw an excellent article in the Tablet today from one of my favorite former Williams professors, K.C. Johnson, on the successes enjoyed by those fighting against the Boycott, Divestment and Sanctions (BDS) movement on college campuses. In particular, he applauds the presidents of Pitzer, Cornell and the University of Michigan for standing up to the BDS movement. On the faculty side, after several minor academic organizations had adopted resolutions committing support to BDS, the American Historical Association seemed poised to follow suit. But the Alliance for Academic Freedom, an organization championed by high-profile professors such as Maryland’s Jeffrey Herf and David Greenberg of Rutgers, engaged the BDS advocates on a variety of grounds, and helped to persuade more moderate AHA members to decisively reject the BDS resolution. 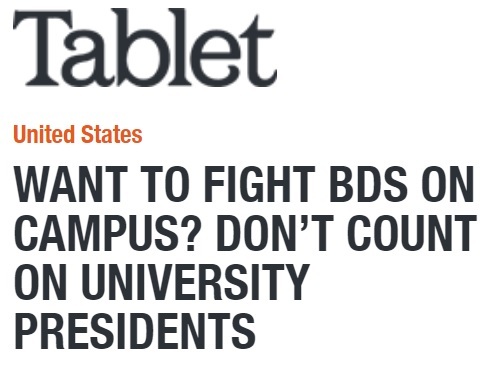 The 2016 vote blunted the momentum of BDS activists in targeting academic organizations. Likewise, Johnson also sees great hope in encouraging students to show courage in combating the BDS movement on their own, potentially with the help of legal talent. Earlier this week, meanwhile, San Francisco State University settled a lawsuit filed by two Jewish students who alleged religious discrimination in one of the nation’s most virulently anti-Israel campus environments. The university agreed to spend $200,000 on “educational efforts to promote viewpoint diversity (including but not limited to pro-Israel and Zionist viewpoints).” The school also released a statement reiterating “its commitment to equity and inclusion for all—including those who are Jewish,” and affirming “the values of free expression and diversity of viewpoints that are so critical on a university campus. It is, of course, a great shame that K.C. Johnson saw his excellent research demeaned while he was a junior faculty member at Williams. According to a report he gave to an Ephblog correspondent, he bailed out rather than endure what looked like a fruitless, upcoming tenure battle. It warms my heart to see such a courageous fellow sticking it out in the academic world, promoting the freedom of speech standards which once made our elite institutions truly elite. David Brooks, the somewhat conservative columnist at the New York Times, has offered his take on the pro-censorship, anti-free speech movement at Williams College. In a tweet on Saturday, Brooks references the student statement opposing the faculty effort to adopt a version of the Chicago Statement and writes: “This is a statement signed by 363 censorship advocates at Williams College. A perfect encapsulation of the fundamentalism sweeping America’s elite colleges.” Most of the comments on Brooks’ tweet were supportive. What an embarrassment to Williams. No reflection on, or even awareness of, their own false premises. And they actually argue that their speech “rights” are violated if they are not permitted to stop others from speaking! Humpty Dumpty “logic”. 1 9 8 4 was a warning, not a guidebook. What’s terrifying is that students are the ones demanding to censor speakers. Students who have no real life experience whatsoever. This is not a good sign of things to come that young people think they know it all. Makes one wonder why a parent would pay the exorbitant tuition at Williams if this is what it produces. There was also the predictable leftist responses as follows. A range of things can happen, and, sure, people get carried away. However, this frenzy of ‘censorship’ isnt happening in a vacuum. We’re seeing hate on the rise, and people are doing what they can to stand up to it. They’re defending the most vulnerable among us, while you shrug. Do you think all of the student who signed fully read the statement? Is this really a movement, or a Fox News boogeyman? I’m MUCH more concerned about the 40+% of Americans who think Trump is doing a bang up job. In my view, the fight for freedom of speech is the most important issue in our nation. The left cannot win if we argue about their policy ideas. When we do argue policy it is too easy for conservatives to point to the real world examples of leftist ideology in action including Cuba and Venezuela. The only way the left can win is by silencing conservatives. It is good that establishment figures like David Brooks are waking up to the censorship running wild at places like Williams. EphBlog is powered by WordPress and delivered to you in 0.769 seconds using 30 queries..